Gosh, that last post was way too depressing. Let's get back to why I love Mexico. 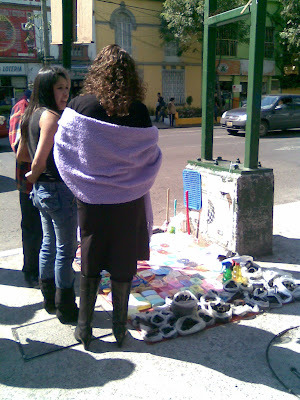 Mexico thrives on its informal economy of street peddlers, and I was very fascinated by this when we moved here. Instead of hopping in your car to reach the neighborhood Target or Wal-Mart, you go to one guy for the lightbulb you need to replace, another guy for a black marker you need for school, and the dude down the street to fix your broken watch. Whatever you might need, you don't have to go too far to find it on the street. Over time, the novelty of going here and there to get my shopping done became routine. But, still, the juxtaposition of completely random items is funny to me. In front of the World Trade Center in Colonia Nápoles is an old man selling the typical gum and cigarettes, but then he also has one or two bags of freshly fried churros. I don't know about you, but I'm a little weary of a man that sells gum with three churros hanging off the side. Wouldn't you rather buy your churros from the boy down the way? Also, if you're ever on Calle Monterrey in Colonia Roma, you can usually find the same three men: one selling Bob the Builder belts, another selling chalkboards, and another selling miniature guitars. I always wonder what the demand (and the supply, for that matter) is for Bob the Builder belts. And, finally, if you will turn your attention to the picture below. Next to the stand where I fetch my favorite Friday treat of chicken flautas is a young, good looking young lady (in black) selling a strange assortment of home wares. Mainly, she has drain covers, soap dishes, and rubber chair leg pads, and minorly (a word? ), she has two spray bottles, three plungers, and one bath mat. She was so intensely trying to sell someone (lady in purple shawl) a drain cover that I thought to myself, "Wow, I am so intrigued by her enthusiasm for drain covers!" If I were selling drain covers, soap dishes, and leg pads for 8-10 hours a day, I might not be as enthusiastic. Doesn't she look like she's having the time of her life? Sooo...what randomness have you seen in Mexico these days? Love the post and one of my favorite things about here is also the multiple things you can get just walking up the street from your house. And I often marvel at how people make money with such random things. I think the coolest thing is that people are so trusting. The store across the street lets us keep a tab. This is something you hardly see in the states between people who hang out with each other. Its always a relief if we are flat broke but need wipes or some diapers that we know we can go next door and pay for them when we paid. I've dedicated this month to taking as many pictures as possible of DF and posting the most interesting one each day. Would you mind adding me to your blogroll?